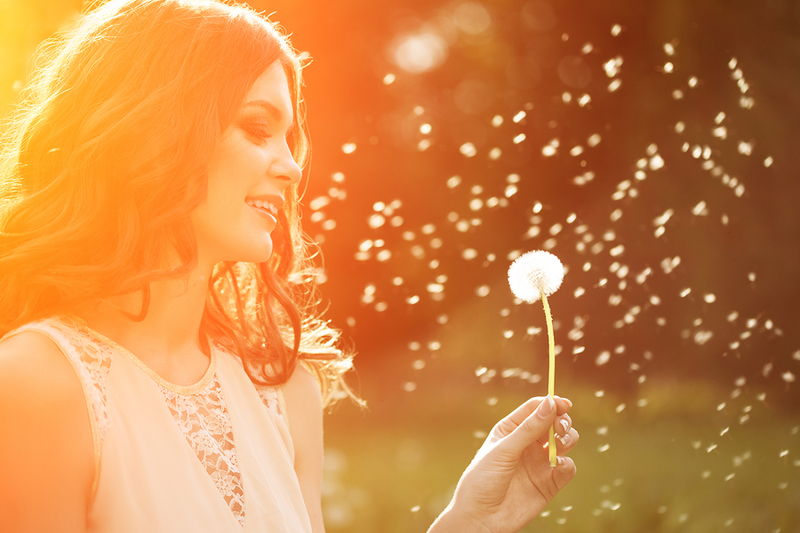 Allergy relief is just a click away. Allergies often represent an immune system out of focus. The immune response attacks harmless allergens instead of pathogens, such as fungi, bacteria, parasites and viruses. 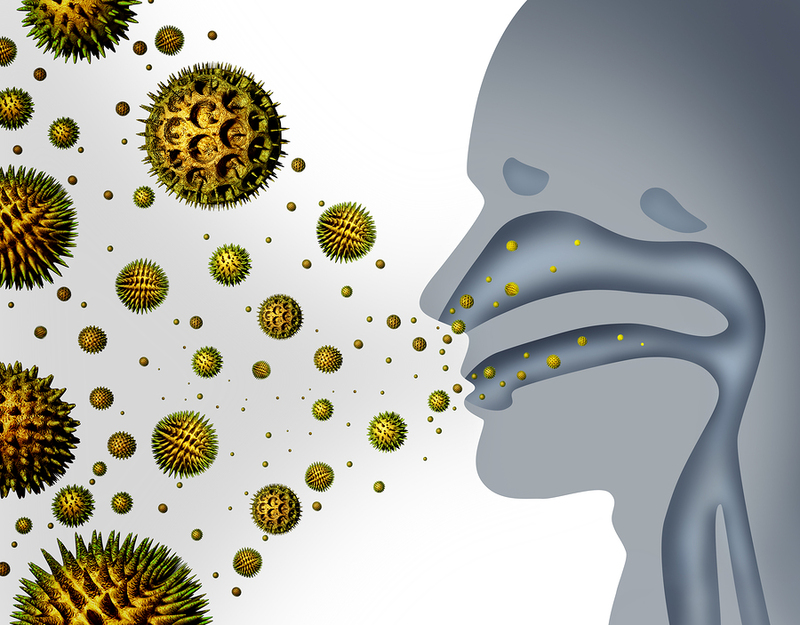 With seasonal allergies, the body reacts to a false alarm. For reasons not fully understood, innocent substances like lint, pollen, dust mites and many foods trigger allergic reactions created by your immune response making a mistake. On entering the body through our food and air, the immune cells mistakenly identify as dangerous that which is not. Recent research indicates the helper T-cells inappropriately activated send out incorrect signals for other immune cells, especially mast cells, to release histamines and the allergic reactions begin. The histamines then constrict airways and create the miseries of hay fever, tearing eyes, skin irritations and much more. Anti-histamines just patch the symptoms for a brief time rather than resolving the immune cells making a mistake. Even temporary relief from hay fever to relaxation of air passages for asthmatics is a good thing. But then we too often do it all over again – because temporary means for only a short time! What is needed is a way to get the immune cells to stop misinterpreting allergens and to return the immune cells to making a proper reaction. You want your immune cells to recognize accurately to then respond rapidly and effectively with no allergic reaction. What can you do as an allergy defense? MG Beta Glucan is a nutritional substance without side effects, such as making you sleepy, that helps contribute on oral intake to the normalization of the immune cells. The immune cells when performing normally, properly recognize pathogens and cease to release the excess histamines. In most instances, if histamines are not released by the mast cells when inappropriate, allergic reactions including sneezing, tearing, rashes and itching can be minimized for most and eliminated for many by your immune cells responding properly. The MG Beta Glucan is an immune cell enhancer and normalizer that acts as a form of fuel to empower your immune cells and remains in your system 24-48 hours. In fact, in scientific terminology, MG beta glucan is a biological defense modifier, meaning to modify your immune cells to make a proper rather than improper immune response. When you have allergies you want the negatives of sneezing, etc., and especially if hay fever (allergic rhinitis), to cease and stay away. That means sprays, antihistamines and steroids are sometimes able to temporarily calm allergies, but only for a brief period of time. And many of these temporary steps have unwanted side effects and can even cause addictions in some instances. The NSC Allergy Defense Package gives you two Immunition weapons for action with immunition being ammunition to help win your allergy war! 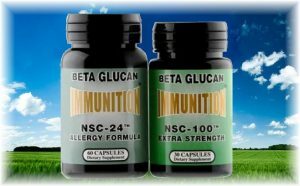 Supplement with the potent and nutritional NSC-100 MG Beta Glucan Extra Strength – 30 ct in 10 mg capsules plus the complex NSC IMMUNITION Allergy Formula – 60 count with MG Beta Glucan and a host of other beneficial nutritional ingredients. Those additional ingredients to MG Beta Glucan in the NSC IMMUNITION Allergy Formula include Vitamin C (500% RDA), Vitamin A, Zinc, Quercetin, Astragalus, Grapeseed Extract, Rose Hips and much more! Together, these two outstanding Immunition Products make up the NSC Allergy Defense Package available only from Nutritional Scientific Corporation (NSC). If for you feeling good is just not feeling bad, you have to try the NSC Allergy Defense Package for seven to twenty-one days and see the results. Contact nsc24@nsc24.com or by telephone at 888-541-3997 for more information or to comment. For detailed label and content information on products in the NSC Allergy Defense Package, click on the individual products above and then on “Supplement Facts”. 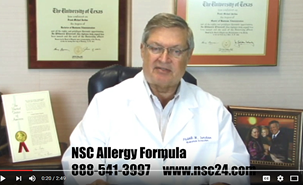 Choose well – Choose the NSC Allergy Defense Package! NUTRITIONAL SCIENTIFIC CORPORATION© 2017-2018. ALL RIGHTS RESERVED.